DEEP SOUTH AUTOMOTIVE IS VERY PROUD TO OFFER ANOTHER HANDPICKED CHERRY OF A TRUCK - SUPER CLEAN, VERY WELL MAINTAINED, NO ACCIDENT CARFAX!!! LOADED WITH FEATURES!!! 2013 TOYOTA TUNDRA SR5 CREW MAX 4X4 WITH THE 5.7 LITER V-8 (THE GOOD ENGINE) - TRD OFF ROAD - NAVIGATION - POWER SLIDING REAR WINDOW - DUAL BACK UP CAMERA - POWER SEAT - RUNNING BOARDS - POWER WINDOWS - POWER DOOR LOCKS - CRUISE CONTROL - PREMIUM 20 INCH ALLOY WHEELS WITH NEW MICHELIN TIRES - AND MUCH MORE!!! THIS IS A VERY NICE AND WELL TAKEN CARE OF TRUCK!!! 121K MILES $25450 REDUCED TO$ 23995 THIS 4X4 TUNDRA HAS BEEN THROUGH AN EXTENSIVE MULTI-POINT INSPECTION BY A CERTIFIED TECHNICIAN. ALL NECESSARY SERVICES HAVE BEEN PERFORMED AT THE APPROPRIATE MILEAGE INTERVAL!! CALL 251-333-5700 OR TEXT 251-422-2762 WWW.DEEPSOUTHAUTO.ROCKS FOR MORE PICTURES AND INFORMATION DEEP SOUTH AUTOMOTIVE 8800 AIRPORT BLVD ACROSS THE STREET FROM BAKER HIGH SCHOOL NEXT DOOR TO AVIS WE ARE PROUD OF THE WAY WE DO BUSINESS AND YOU WILL BE TOO! 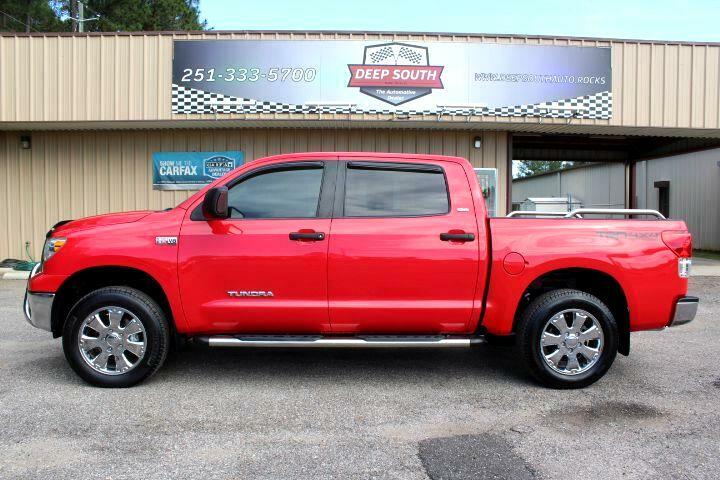 Visit Deep South Trailer Works LLC online at deepsouthauto.rocks.com to see more pictures of this vehicle or call us at 251-333-5700 today to schedule your test drive. Message: Thought you might be interested in this 2013 Toyota Tundra 4WD Truck.